The Sony PVM-A170 is a slim and easy to set up Trimaster OLED panel offering fantastic colour accuracy and the widest viewing angle of any available professional flat panel broadcast monitor as of January 2014. It is lighter than its predecessor, the PVM-1741A by a full 40% and as a result is easy for one person to carry by hand, hence the inclusion of a detachable carrying handle. It is also designed to withstand the rigours of daily use and has a tough double-coat paint finish. The PVM-A170 is supplied with a screen protection kit. This accessory provides an (anti-reflective) AR-coated protection panel for the portable 17-inch monitor, along with corner bumpers to safeguard the monitor from scratches and impact. The benefit of this is significant when renting out these monitors – for example, panel damage is reduced and there is a far lower incidence of panel replacement and downtime during rental cycles. The PVM-A170 monitor achieves the industry-leading lightweight and slim body* – the PVM-A170 weighs 4.2 kg and is approx. 40 per cent thinner than the previous PVM-1741A model. This advantage allows users to widen their applications, including field monitoring and installation on the monitor wall and OB van. *Comparing professional broadcast monitors incorporating SDI interface(s) and built-in AC power. The PVM-A170 incorporates the TRIMASTER EL™ OLED panel and offers the industry’s widest viewing angles for any professional flat-panel monitor on the market. The BKM-PP17 protection kit provides an AR-coated protection panel for the 17-inch monitor, along with corner bumpers to safeguard the monitor from scratches and impact. The PVM-A170 has screw holes on its side bezels for yoke-mounting. This type of mounting is convenient when installing a monitor to a camera crane or monitor stand in the field. There are also VESA mount 100-mm pitch holes on each monitor’s rear panel. An input signal’s waveform and vector scope with an SDIembedded 2-channel audio level meter can be displayed on screen. Both the waveform monitor and vector scope have various modes, including a zoom function (in an area of 0 to 20 IRE) with the waveform monitor, and a zoom function (in the central black area) with the vector scope, for adjusting white balance. The waveform of a specified line can also be displayed. In conjunction with the Picture & Picture function*, the waveform monitor and vector scope display can monitor two camera signals. In addition, an audio level meter can display the embedded audio signal from the SDI or HDMI input. It can display on screen the ch1 to ch8 or ch9 to ch16. The PVM-A170 monitor can control the aperture level of a video signal, and display images on the screen with sharpened edges to help camera focus operation. Further to this, the sharpened edges can be displayed in user-selectable colours (white, red, green, blue, and yellow) for more precise focusing.Line-doubler* mode for field dominance check and time code function. The PVM-A170 offers a line-doubler mode, which is helpful when checking for field order and line flicker. In addition, LTC and VITC time code can be displayed at the top or bottom of the picture. The PVM-A170 monitor employs a software-based colour temperature (white balance) calibration function, which is called Monitor_Auto White Adjustment. Combined with a PC and commercially available calibration tools*, this function enables simple adjustment of the monitor’s white balance. *The Konica Minolta CA-210/CA-310/CS-200, DK-Technologies PM5639/06, X-Rite i1 Pro/i1 Pro2, Photo Research PR655/670, Klein K-10, and JETI specbos 1211. The unique Picture & Picture function of the PVM-A170 allows simultaneous display of two input signals on the monitor’s screen. This function helps with colour adjustment and setting of camera frames. Various modes are available: side by side, wipe, blending, difference and auto input switching. This function works when synchronous SDI signals are input. The PVM-A170 monitor can display the camera and lens metadata set of a camera system, according to the SMPTE RDD-18 document for Acquisition Metadata Sets for Video Camera Parameters. Further to this, these monitors also support a subset of Sony’s private metadata. ** The monitor is also equipped with a three-colours red, green and yellow on-screen tally function. The position of the tally display can be changed to either the upper or lower section of the screen. **Not all metadata is supported. **Only 3G/HD-SDI and dual-link HD-SDI are supported. ***Only SD-SDI signals are supported. Grid Display function displays arbitrary multiple vertical and horizontal lines to help when users check the composition of a picture. In addition to a standard Centre Marker 1, Centre Marker 2 is also available. This second marker enables easier checking of the centre portion’s focus. The Flip function turns the reversed image to a normal view, horizontally or vertically. Power-on setting allows users to make choice when the monitor starts up; this includes last memory, user preset, and factory preset settings. So, users can set the monitor accurately and quickly. This function is very useful for rental equipment. DC power supply is available in the range of 12V to 16V. The power indicator blinks when the DC power supply is low. In addition, the USB 2.0 port can supply 5 V power to third-party devices. When multiple users share the same monitor, each user can memorise his/her setting data and retrieve this data whenever required. This frees the user from time consuming and repetitive setting tasks. When multiple users share the same monitor, each user can register his/her own password for colour temperature and user preset data. This ensures the user correctly recalls previous user preset data, and keeps preset information safe from unauthorised use. For improving speed of the F-Key configuration, the user can take a short-cut to the settings menu screen by simply pressing the function key repeatedly. An I/P conversion system delivers automatically optimised signal processing according to input signals, with low latency (less than 0.5 field). This helps with editing and monitoring fast-moving images, and with synchronising audio with lip sync.Multiple monitors upgrade utility*Multiple PVM-A and LMD-A Series monitors on the same Ethernet network can be upgraded by simple operation providing an efficient solution for large infrastructure. 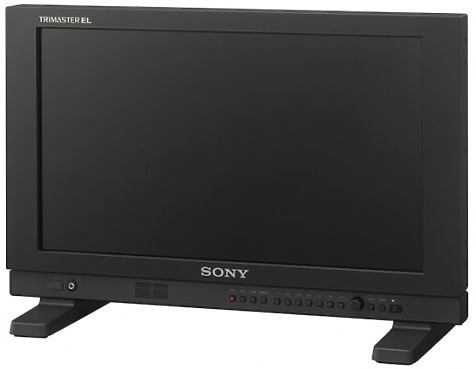 Hire the Sony PVM-A170 17 inch OLED Monitor from Procam. Best service and rental rates for the Sony PVM-A170 17 inch OLED Monitor and all cameras, lenses, sound, lighting and grip.